This is the first in a two-part series about tools which can be used to look at text in unusual and interesting ways. 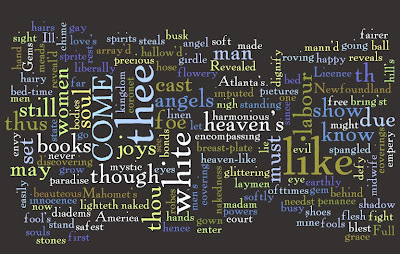 First up is Wordle, which produces beautiful typographical representations of any text that you feed into it. Below is my version of John Donne's elegy 'To his mistress going to bed'. It took me about two minutes to produce and I think it's great. The Wordle image is copyright Wordle.net. Part 2 on Tuesday.